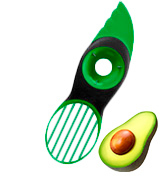 The plastic serrated blade is potent enough to cut any avocado to its core, all without being too sharp to the touch. The fan blade that lifts the actual edible fruit from its skin in seven perfect pieces. After that, you can easily spread these little pieces all over a toast and enjoy a delicious and healthy breakfast. The pitter only really fits smaller and medium-sized pits. 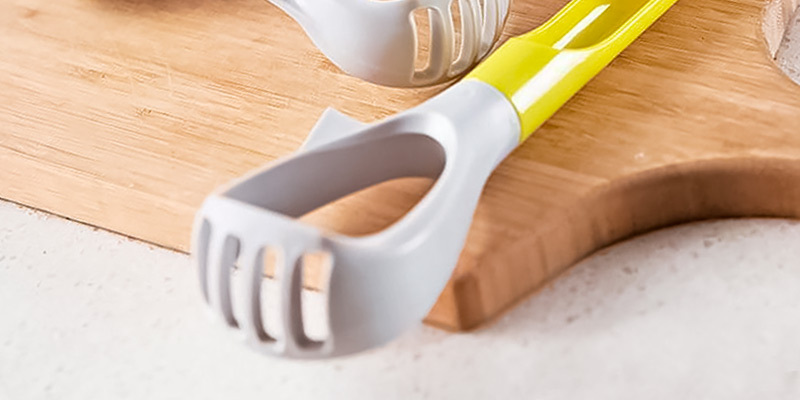 This model from OXO Good Grips, with its well-thought-out construction and practical design, doesn't really leave a whole lot of room for complaints. Though a slicer like that is an inherently simple tool, this one does it all a little better than most. 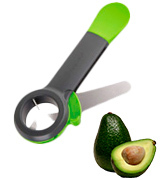 The model's metal blade incorporates a serrated edge that lets you easily cut the avocado in half. Its rounded side is sharp enough to slice the inner avocado, all without cutting through the skin. Plus, the blade safely stores inside the tool's main body, excluding any injury risks. The plastic paddle is a little impractical. Prepworks by Progressive Flip-Blade Avocado Tool is a little different compared to the usual avocado slicer and we like the model for it. In some ways, it is more comfortable and, at the very least, just as effective as its regular counterparts. 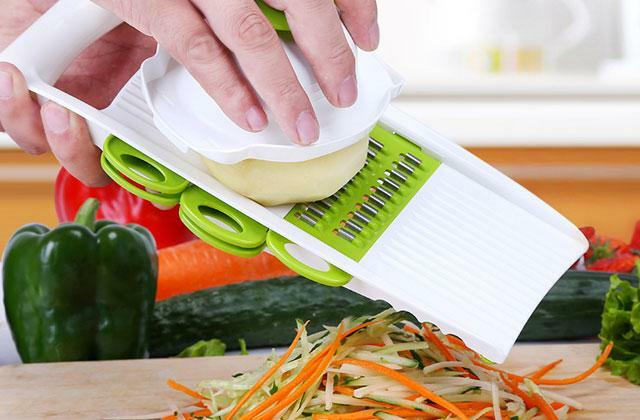 The plastic pitter lets you remove any pit of any size without damaging the fruit. All of the materials here are food-grade, so you won't be dealing with any additional smells or flavors. Cutting the fruit into 11 perfect pieces, the wired end provides a little more culinary opportunities compared to regular slicers. The stainless steel handle isn't ergonomic. Amco 8685 isn't without its flaws but the model also has a lot going for it, enough to edge out most avocado slicers on the market right now. With it, you'll be able to eliminate the mess and cut these alligator pears without damaging the fruit. 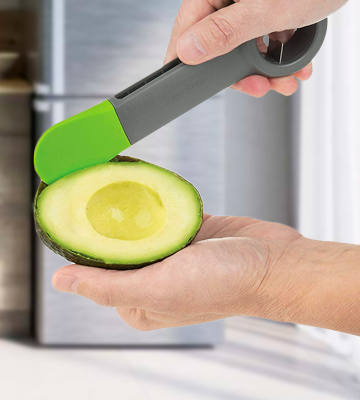 The slicer will allow you to mash and carve avocados. It will help you prepare guacamole in no time at all. 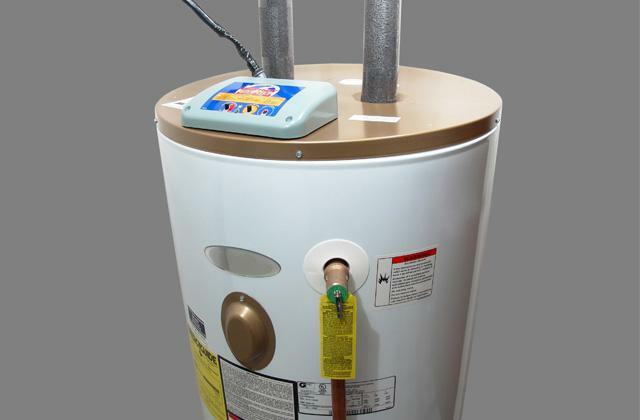 Its plastic construction is immune to rust and corrosion. You can use the model with other fruits. For example, it is perfect for removing pedicles from apples. The splitting blade is really sharp, so you'll have to be extra careful with it. 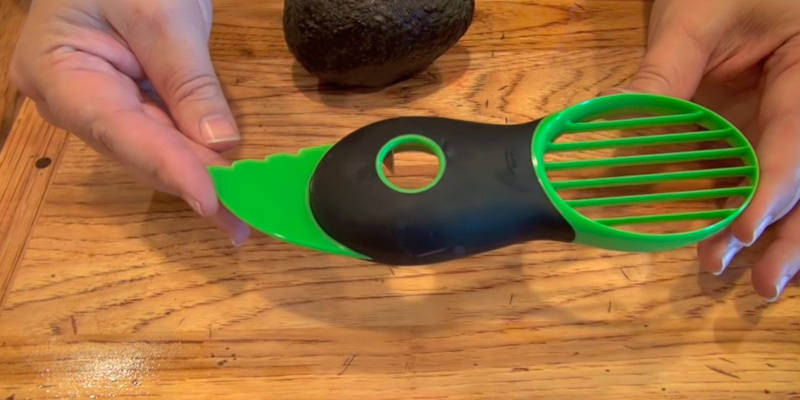 If you're looking for the most versatile avocado tool and don't feel like paying extra, what we have here is easily the best bang for your buck. 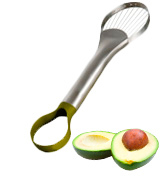 Using this tool, you'll be able to prepare avocados any way you like and you won't need to switch utensils. The handle is really long and comfortable. It offers a snug but firm grip and doesn't put a strain on your hand. Furthermore, it comes equipped with a hanging loop, providing you with additional storage options. The green top part is relatively flimsy. 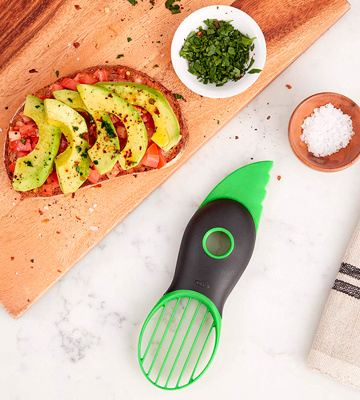 UNIQUEE 3-in-1 doesn't differ all that much from your average avocado slicer. It is a little more comfortable, a little more practical, and it costs a little bit less, making for a solid product that deserves the last spot on our list. 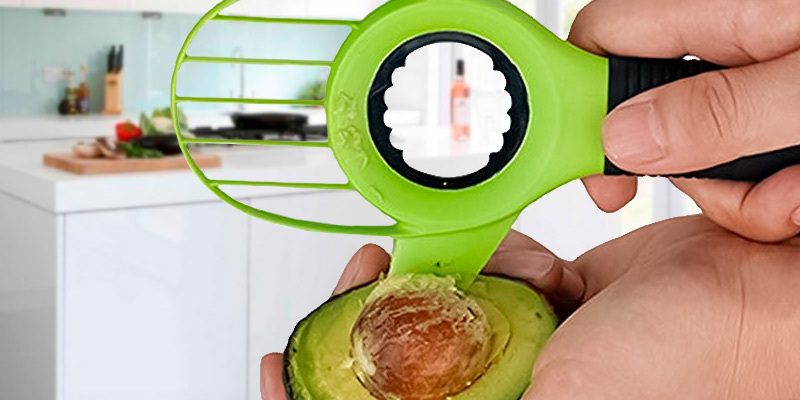 With this little kitchen tool from OXO Good Grips, you'll be able to split, pit, slice, and scoop avocados about as safely, easily, and effectively as it can be. Using the stainless steel pitter, you'll never fail to remove pits with but a single twist of your wrist. You might have some issues with abnormally large avocados but that statement applies to just about any slicer out there. 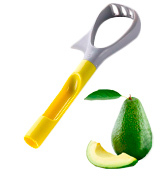 The plastic serrated blade is potent enough to cut any avocado to its core, all without being too sharp to the touch. The "slicing" part, of course, comes from this nice little fan blade that lifts the actual edible fruit from its skin in seven perfect pieces. After that, you can easily spread these little pieces all over a toast and enjoy a delicious and healthy breakfast. The plastic handle is ergonomic, soft, and overall comfortable. It gives you a nice non-slip grip without any extra baggage like cramping or hand fatigue. 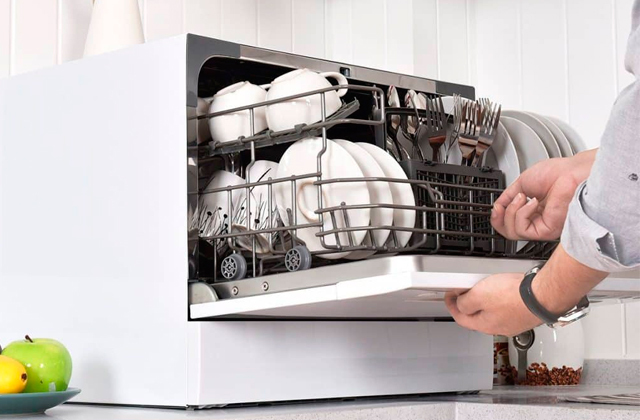 As per usual, the slicer is top-rack dishwasher safe, meaning you shouldn't have any maintenance issues with it. The stainless steel parts aren't susceptible to rust and corrosion and the plastic parts are surprisingly sturdy. 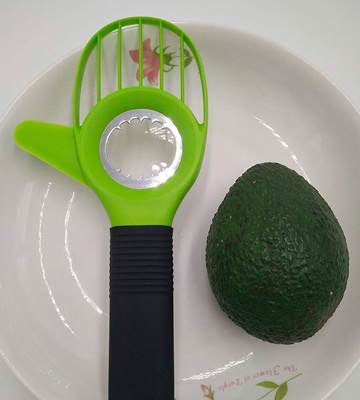 This avocado tool from OXO Good Grips, with its well-thought-out construction and practical design, doesn't really leave a whole lot of room for complaints. Though a slicer like that is an inherently simple tool, this one does it all a little better than most. Prepworks by Progressive presents an interesting slicer here. It doesn't incorporate the usual fan blade that cuts the actual fruit into different pieces. Instead, what we have here is more of a flip-blade, with its own advantages and disadvantages. First, for our taste, it is a much more comfortable tool compared to the usual avocado cutter. 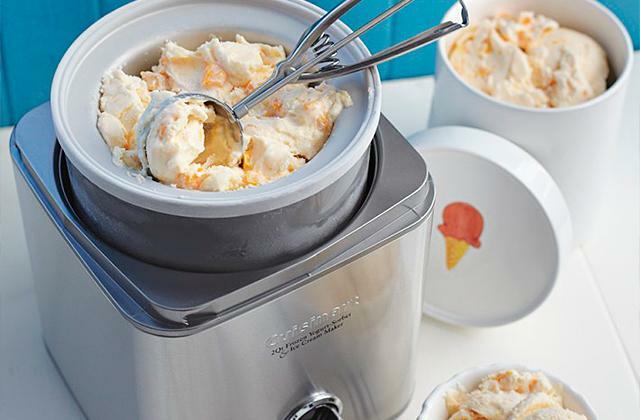 Its BPA-free plastic handle with its soft-touch coating will make sure the slicer won't slip out of your hands, so you'll unlikely be able to injure yourself, regardless of how awkward and clumsy you may be. 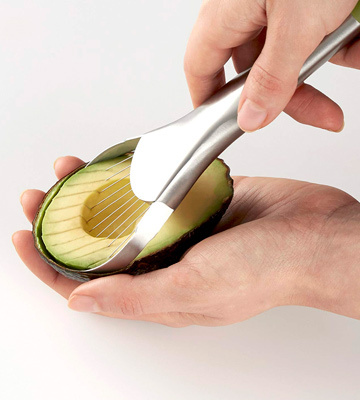 The model's metal blade incorporates a serrated edge that lets you easily cut the avocado in half. Its rounded side, on the other hand, is sharp enough to slice the inner avocado, all without cutting through the skin. Plus, the aforementioned blade safely stores inside the tool's main body, further excluding any injury risks. As it is usually the case with these tools, the model comes equipped with a pit remover in its curved handle. The remover safely punctures and, surprisingly enough, removes the pit. Furthermore, it doesn't discriminate between pits, able to remove the smallest as well as the biggest pits. Bottom line, Prepworks by Progressive Flip-Blade Avocado Tool is a little different compared to the usual avocado slicer and we like the model for it. In some ways, it is more comfortable and, at the very least, just as effective as its regular counterparts. Amco 8685 doesn't incorporate any plastic parts except for the pitter, so, in a way, it is the sturdiest, most robust tool on this list. 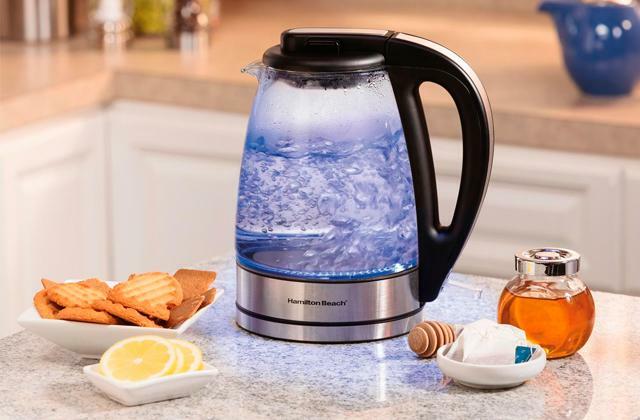 It is completely dishwasher safe, which is always a plus in our book. However, it isn't like the model doesn't have its disadvantages either. 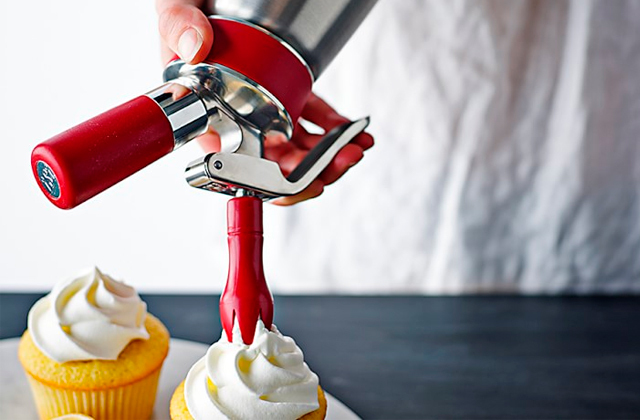 Without any plastic inserts, the stainless steel handle just isn't all that ergonomic. 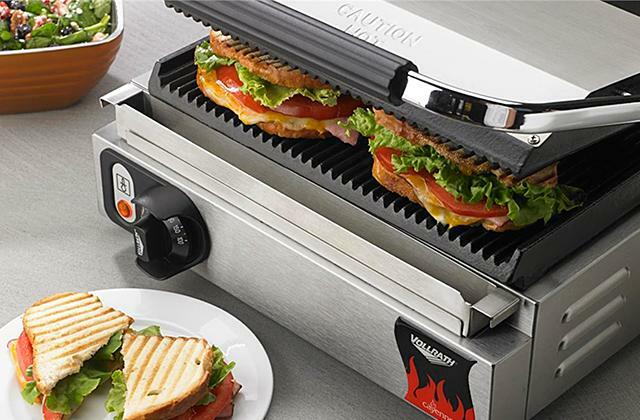 Comfort aside, it doesn't have that non-slip grip to it, so we wouldn't recommend using the slicer with wet hands. On the bright side, the aforementioned plastic pitter will allow you to remove any pit of any size without damaging the fruit. As you'd imagine, a nylon loop like that is much safer than a knife. Plus, all of the materials here are food-grade, so you won't be dealing with any additional smells or flavors. We really like the wired blade here. With this nice little wired end, it is just so easy to slice the avocado precisely as you guide it over the fruit. After that, you can just as easily turn the slices into a dish or plate. Cutting the fruit into 11 perfect pieces, it provides a little more culinary opportunities compared to regular slicers. Long story short, Amco 8685 isn't without its flaws but the model also has a lot going for it, more than enough to edge out most avocado slicers on the market right now. With it, you'll be able to eliminate the mess and cut these alligator pears without damaging the fruit. Auony 5-in-1, as that "5-in-1" part implies, is easily the most versatile tool here. With it, you will just as well be able to split the fruit into different pieces. 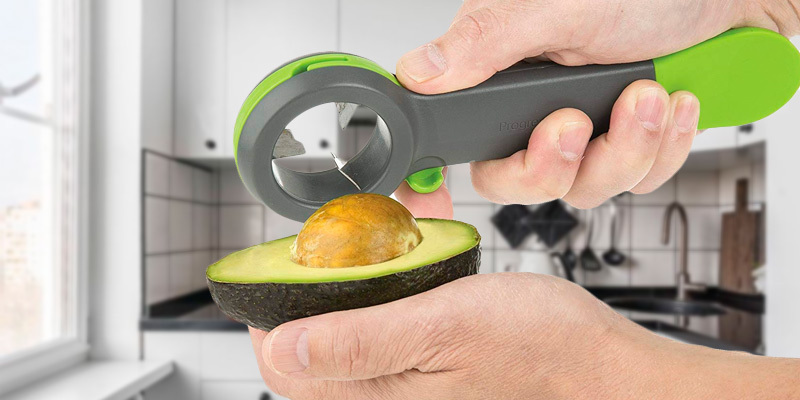 It will let you slice avocados and remove pits. 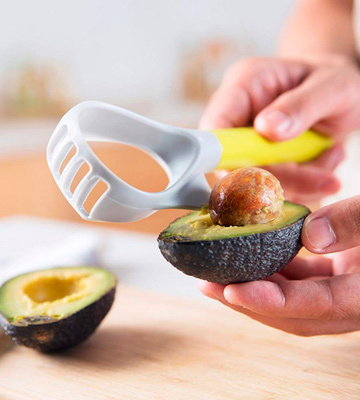 On top of that, however, this little tool will also allow you to mash and carve them, so you won't have to switch utensils to prepare the avocado. 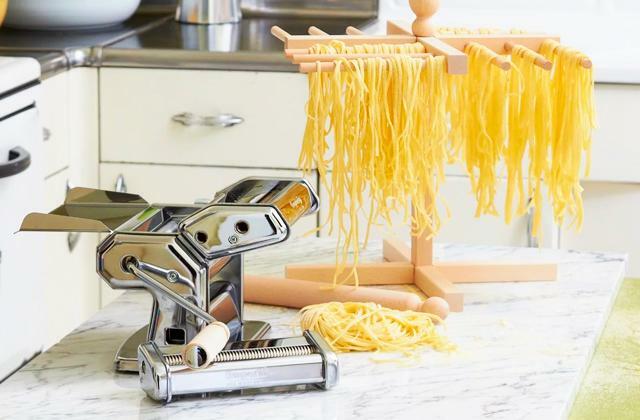 Using this kitchen tool, you'll be able to prepare your favorite snack a number of different ways in a matter of seconds. Of course, considering that the model comes at a modest price tag and is so much more versatile than the usual deal, there has to be a slight flaw here or a minor downside there. As far as we're concerned, the splitting blade is a little too sharp, so you will have to be extra careful with it, provided you don't feel like cutting yourself. The whole thing is plastic, which is good on one hand because plastic isn't prone to rust and corrosion. On the other, it is a little less sturdy and rugged than its stainless steel counterpart. Both materials, more often than not, are dishwasher safe but plastic, at least here, dries a little quicker, which is always nice. All in all, this is an easy choice to make. If you're looking for the most versatile avocado tool and don't feel like paying extra, what we have here is easily the best bang for your buck. 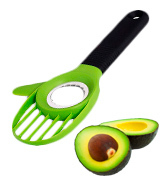 Using this tool, you'll be able to prepare avocados any way you like. UNIQUEE 3-in-1 is the most affordable product here. Well, it is a little more affordable and also, as far as we're concerned, just a little bit worse compared to every other model on this list but better than the majority of these tools on the market right now. 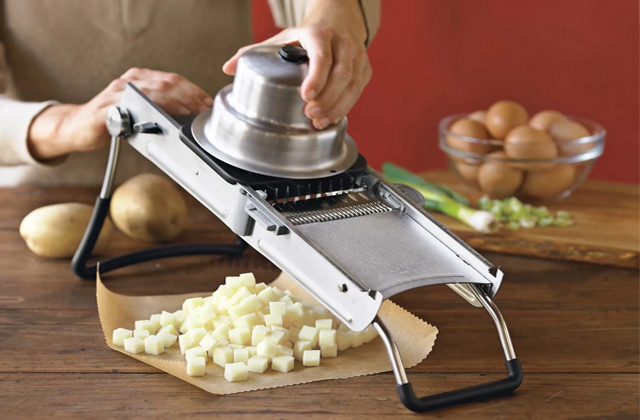 Except for the stainless steel pitter, the whole thing's constructed from food-grade plastic and silicone. It doesn't transfer flavors and odors between foods, so you'll always be able to enjoy that fresh avocado taste without any extra tastes. The handle is really long and comfortable. It offers a snug but firm grip and doesn't put a strain on your hand. Furthermore, it comes equipped with a hanging loop, providing you with additional storage options. 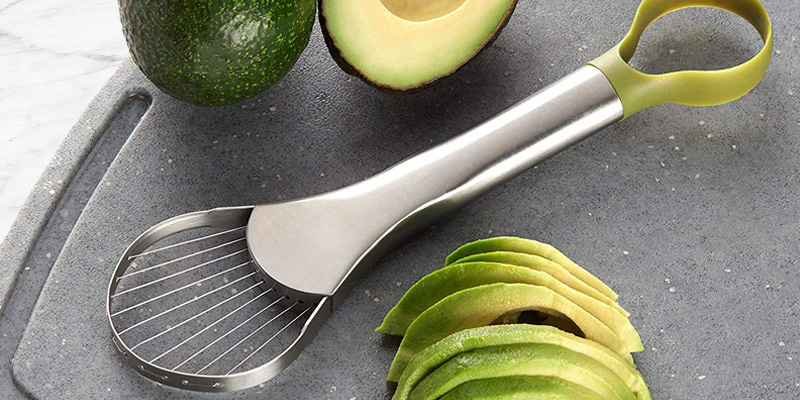 The tool is a little larger than your average avocado slicer and we definitely like the change. This way, it doesn't matter how big the avocado, you'll always be able to slice it, remove the pit, and split the fruit. That being said, that green top part is a little flimsy, so you might want to tread lightly with it. Neither the stainless steel pitter nor, naturally, the model's plastic parts are susceptible to rust and corrosion. 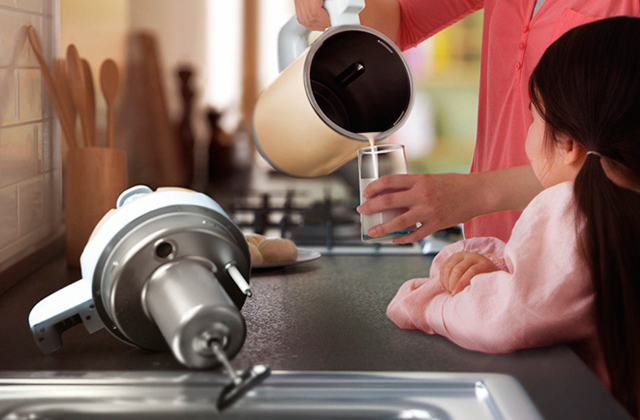 Plus, the tool is easy to clean, making maintenance a breeze. To put it a little differently, UNIQUEE 3-in-1 doesn't differ all that much from your average avocado slicer. It is a little more comfortable, a little more practical, and it costs a little bit less, making for a solid product that deserves the last spot on our list. What Is an Avocado Slicer? Avocados are all the rage these days. The fruit has seen such a rise in popularity over the past decade in the United States (as well as the Western world in general) that drug syndicates are beginning to take over the industry, forming literal Avocado cartels. Dubbed the "green gold", avocados are changing the economic landscape in Mexico and it doesn't seem like their culinary conquest is about to slow down anytime soon. Frankly, it is hardly a surprise. Avocados are delicious. They offer a number of health benefits. They aren't all that expensive either and, as an ingredient, it is easily one of the most versatile fruits out there. About the only issue most people have with avocados is that they're relatively difficult to peel and prepare. But, with an avocado slicer, it will take you minimal time and effort to do that. These little tools are really easy to use, overall practical, and relatively affordable. Provided you're as crazy about avocados as the rest of the world seems to be right now, you should definitely consider buying one of these slicers. 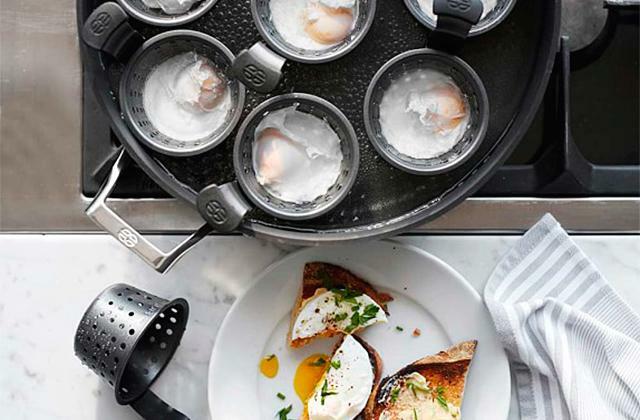 Want something a little more versatile in addition to an avocado slicer? 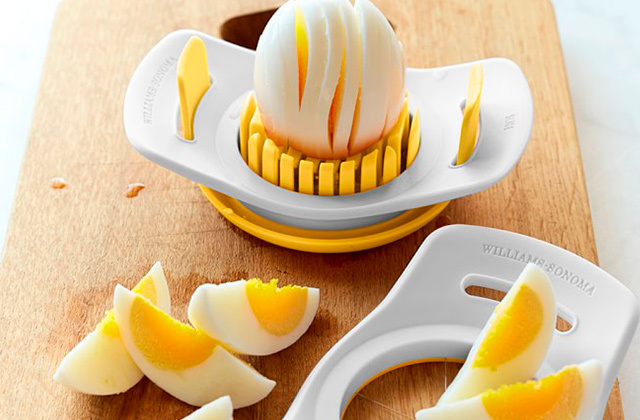 Consider one of these mandoline slicers or egg slicers (the latter are able to slice much more than just eggs).